It seems that this is the first time when Italy has got a player, who to public mind, is able to equally compete with chess elite in the closest future. Fabiano Caruana became famous after his victory in the very strong Wijk aan Zee and his bright performance at the Russian Team Championship. Thanks to these results, he was nominated by the FIDE President to participate in the World Chess Cup. Fabiano Caruana: I will tell you more. At one point my position was absolutely hopeless. I could see many positions where my opponent could finish the game in his favor. But Lazaro, to my surprise, did not use the chances… In general, I was very lucky today. Q: Your impressions about Khanty Mansyisk? Fabiano Caruana: I could not even imagine how beautiful the city could be. They have everything for good life: good hotels, shops, restaurants. Also, I like very beautiful architecture. It is a bit cold here, but it is not that crucial. Q: For Italian, you speak good English. Fabiano Caruana: Nothing special. I was born and grew up in the USA. But at some point it became clear that for a professional chess player it is better and more convenient to live in Europe. Here all important and strong tournaments take place. Everything is very close; you don’t have to waste time for travels and acclimatization. Q: There are no strong tournaments in the US? Fabiano Caruana: I can only say this: the situation with chess is not that easy in the States. Q: Do you have a permanent coach? Fabiano Caruana: I had a lot of them. My first coach – American Brus Pandolfini. He is more famous with his chess books. At one point I had come to the level where I had to ask help from more known professionals. In New York Miron Sher worked with me, in Spain – Boris Zlotnik, in Hungary – Alexander Chernin. With the latter I am still working. Here in Khanty Mansysk my father helps me. Q: Is he also a coach? Fabiano Caruana: He morally supports me. This is actually all I need now. Q: You are considered to be one of the most talented young chess players in the world. What ambitions do you have? To be one of the strongest in the world? To become World Champion? 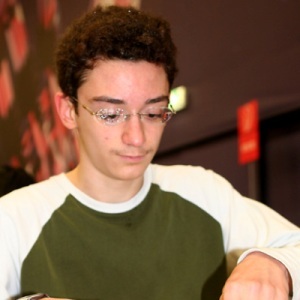 Fabiano Caruana: I am planning to go as higher as possible. To my mind I can go far. I might sound immodestly but I believe I could be the best player. But this is only the matter of time. Q: Are you famous in Italy? 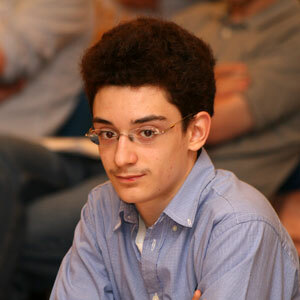 Fabiano Caruana: I give a lot of interviews and in general I can say that I am famous enough. But it is also clear that my popularity is nothing in comparison with soccer players. Q: Do you have a Government support? Fabiano Caruana: Italian Chess Federation annually pays me a salary. But so far I don’t have any sponsors or other financial resources. Q: You play for Russian club “64″. What can you tell us about Russian chess? Fabiano Caruana: I can say that I like Russian team. I don’t think one could say something new about Russian chess: it is well known that Russia – is the strongest chess country for a long time. Of course other countries are making big progress, but Russia remains the best.